Companies that pay drivers and other employees commission require the ability to modify pricing structures to include commission when appropriate. They require more than an on/off switch to indicate when a charge is eligible for commission — they need a sliding scale that is applicable on a per charge basis. OnTime has taken these needs into account and has features that allow commission-based rates to be calculated with optimal efficiency. To apply an adjustment to a service level’s base price, open the corresponding price set and set the percent of base price eligible for commission. To make an adjustment to an individual charge, such as a fuel surcharge, open the corresponding price modifier and set the percent eligible for commission. The Time and Activity reports will show the commission earned by a user, both summary and detailed by order. If you have questions about how this feature might work in your company, feel free to contact technical support for more information. During order entry, dispatchers may unintentionally leave important fields blank. OnTime offers an option to set order entry requirements on global and customer levels, issuing an alert if a required field is not filled on a particular type of order. OnTime's required fields feature offers multiple levels of customization. This feature will ensure that orders are filled out completely from the very start. Go to the Home tab and choose General Options. 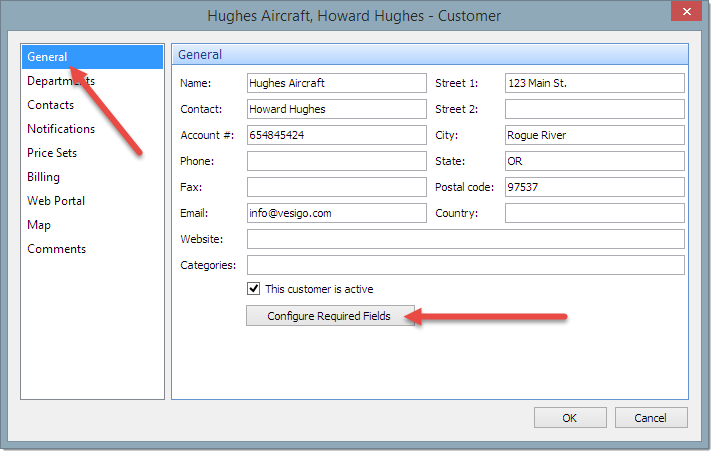 Select the Order Entry tab and click the button labeled Configure Required Fields to choose the fields that should be required. Navigate to the Customers list. Open the customer whose required fields you want to set. Select the General tab and click the button labeled Configure Required Fields to choose the fields that should be required. If you have required fields set at both the global and customer level, the requirements are combined and both apply. While OnTime already offers Enterprise subscribers robust and feature-rich tracking via the OnTime Customer Web Portal, this does require shippers to be set-up with an account and then log into the web portal to access these tracking features. If you need a simplified why to provide your customers with tracking and tracing, using OnTime’s web site tracking applet may be a great option. This makes it possible for your customers to enter a tracking number and get back immediate, real-time results of their order. The tracking applet is available, free of charge, for all subscription levels. This small form may be inserted into any of your web pages. OnTime generates the necessary code that is then inserted into your web page by you or your website developer. This tracking applet will allow a shipper to enter their tracking number and receive real-time status information about their shipment. Even proof of delivery, including signatures at both collection and delivery points, will be displayed. Select the Tools tab and choose Web Site Applets. Click on the Generate order tracking form link. 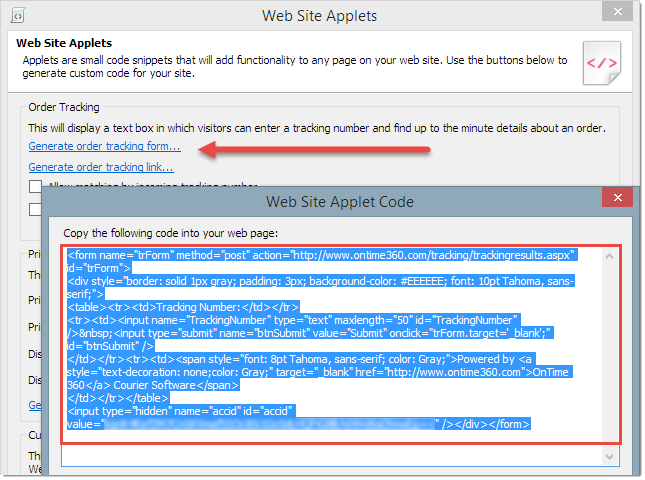 Copy the generated code to the desired location on your web page. The code inserted by you or your website developer will automatically generate the form needed by shippers to track their orders. If you have any questions about how to integrate this tool into your web site, feel free to contact technical support. OnTime synchronizes information in batches, not one record at a time. This technique improves performance while also allowing you to work efficiently, even when your internet connection becomes slow or disconnects. Click the Data File Management button. Select the Statistics tab to view Pending items. The number of Pending items represents the number of changes that are waiting to be synchronized to the OnTime server. 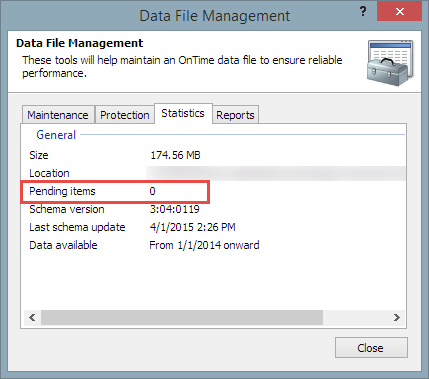 Sometimes, when new features are implemented or synchronization issues arise within OnTime Mobile for Windows Mobile, rebuilding the associated data file is necessary. Note: A stable and reliable internet connection is required to perform this operation. We do not suggest performing the following steps if there is a possibility that you will lose internet connectivity. Open OnTime Mobile and sign in. Wait at the home screen for the initial synchronization to complete. Click on the Tools menu and choose Options. Click the Repair Database button. If the repair is successful, a message will appear indicating success and that the application is synchronizing with the server. Dismiss the message and tap Cancel to close the Options screen. Wait for the synchronization process to complete before using the application. Once synchronization is completed, resume using the program. If the steps outlined above do not work as desired, try performing a soft reset on your device and repeating the process. If you still are not satisfied with the results, contact our technical support team for assistance. OnTime Mobile may be installed to a Windows Mobile 6.5 device via connection to a desktop computer. Alternately, the delivery software may be installed directly on the device. This method is useful, especially when you do not have immediate access to a desktop computer. From your Windows Mobile 6.5 device, open Internet Explorer and navigate to ppc.ontime360.com. Tap the Download Now link. Choose Menu and then Open. The program will download, usually to the “My Documents” folder. Once downloaded, installation will start. The installation screen will appear for a few moments while the app is installed. Once installation is complete, an “All Done” message will display at the bottom of the screen. Then the installer will automatically close. A shortcut for OnTime Mobile should be in the Start menu, toward the bottom. Tap the shortcut to launch OnTime Mobile. 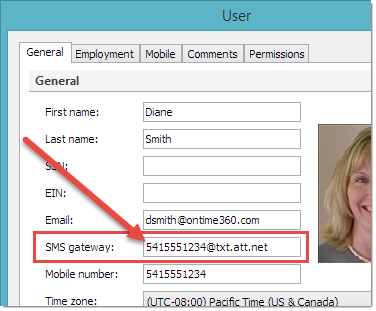 OnTime can use email to SMS gateways to send text messages to a driver’s phone or pager. This functionality can help to save money by avoiding SMS sending fees. If you have trouble locating the correct address, contact the driver's mobile service provider for assistance. Finally, don’t forget to test the address before using the phone in the field. Test messages in OnTime and try sending an email to the address to ensure that everything is working properly. 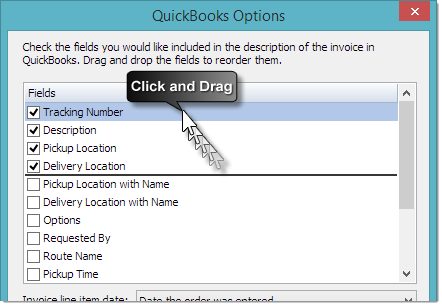 Click the Options button to be presented with a list of fields that you may include in your invoice when it is sent to QuickBooks. 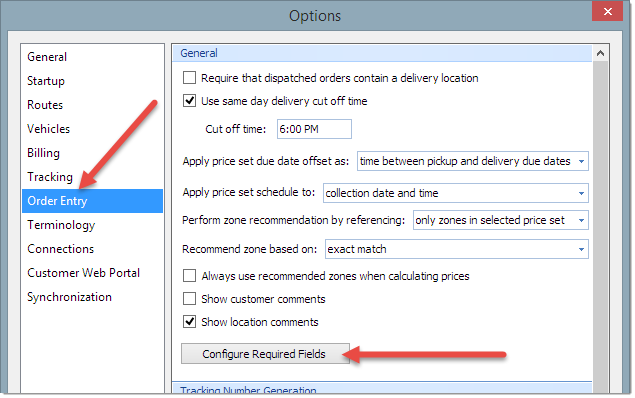 Once you have selected the fields to be included on invoices sent to QuickBooks, click OK to save changes and complete customization. 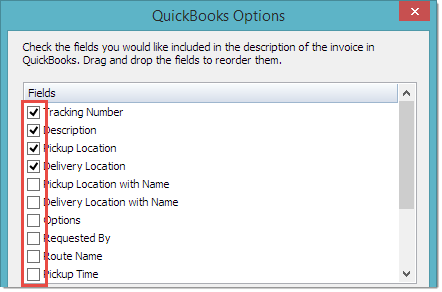 Note: You will need to have administrative access to QuickBooks to adjust some of the settings below. If you do not have that access, contact your QuickBooks administrator to change these settings. Start QuickBooks and load the desired company file. 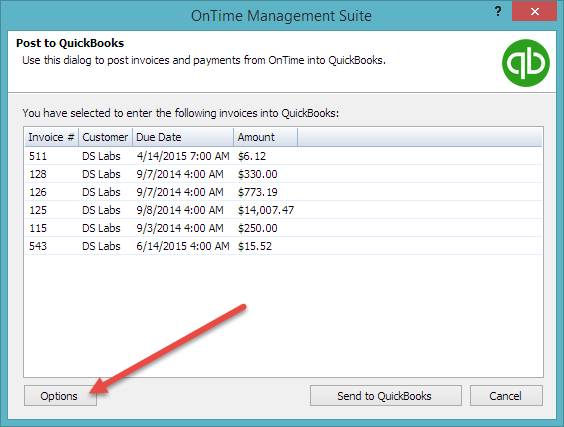 Open OnTime Management Suite and attempt to post an invoice or payment to QuickBooks. A prompt window should appear. 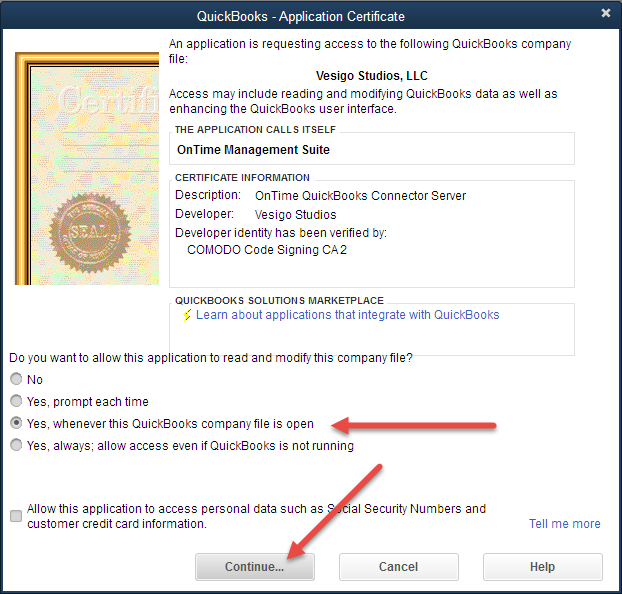 If it does, select the option Yes, whenever this QuickBooks company file is open and click Continue. 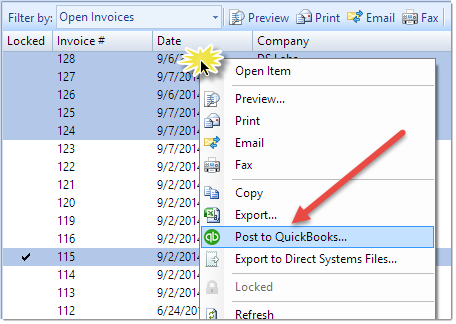 If you still have trouble posting to QuickBooks or the window shown above does not appear, close all programs and restart your computer. Sometimes rebooting will help clear out cached settings in QuickBooks that prevent third party programs from connecting properly. After restarting, open QuickBooks and the desired company file. In QuickBooks, select the Edit menu and choose Preferences. Select the Integrated Applications section. Select the Company Preferences tab. 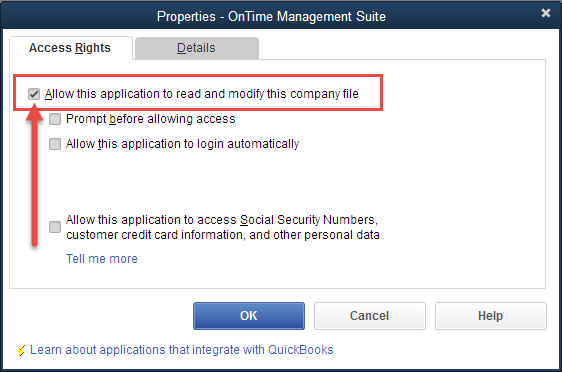 Ensure that the check box labeled Don’t allow any applications to access this company file is unchecked. With the OnTime entry selected in the list box, click the Properties button. Click OK to save the changes in QuickBooks and close all windows. Attempt to post an invoice or payment from OnTime. If still unable to connect, contact our support staff.